Two things have been the focus (okay, focii) of my faculties in recent weeks. The first, of course, has been working on my book. Chapters 1 through 11, as well as the preface and the prologue, are now locked-down and pretty much finished apart from some, shall we say, "supplementary material" that is going to provide a very intimate look into the mind of a manic-depressive. Those chapters constitute Part 1. I'm going to start writing Part 2 tomorrow. And the chapters for Part 1 aren't the only ones already finished: the first several that I wrote haven't been assimilated into the main manuscript yet. Those will add substantially more material. But yesterday afternoon I took some time to read the preface, the prologue, and Part 1. I made note of how long it took to read all of that. It took a little over two hours. Factoring in that my reading was probably faster than a first-timer's because I'm already intimate with the material, that might be two and a half, to three hours reading time thus far. If it comes out around five or six hours, that should be plenty. Anyway, I'm quite happy with progress thus far! The second thing that has been on my mind has been Doctor Who, and Peter Capaldi's first steps as the Twelfth Doctor which began in earnest with the season premiere "Deep Breath" two weeks ago. Since then we've had "Into the Dalek" and last night's "Robot of Sherwood" (penned, I noticed, by Mark Gatiss, who seems to be everywhere lately). And I've had some time to think about it all. And what do I make of the Doctor's adventures thus far since his regeneration from the Matt Smith era? There is a scene that accompanies every regeneration. It has never had a formal name. I call it the "assumption scene". The regeneration itself is the renewing of the Doctor's body and the beginning of his new personality. Everyone knows that. But for me that's never been the real beginning of a new Doctor's career. That comes later. It comes when the Doctor properly assumes the role along with whatever costume he has chosen for the part. "The Christmas Invasion" in 2005 has David Tennant's Doctor running around in pajamas and defending the Earth, but for the most part that was not the Doctor. Not yet. He's the Doctor when he comes out of the TARDIS's wardrobe in his now-classic duds and shows up at the Tyler's flat for Christmas dinner. Then he was the Doctor. The rest of the time since regenerating from Christopher Eccleston he was a "quasi-Doctor". And then in "The Eleventh Hour" there was Matt Smith running around in the Tenth Doctor's rags. Toward the end of the episode he takes new clothes from the hospital's locker rooms, takes on a new look (especially the bow tie) and stares down the Atraxi... and then in that climactic moment he declares once and for all "I am the Doctor". That is the moment when Matt Smith truly became the Doctor. The assumption scene. Which to me is just as crucial for the new Doctor's career as is the regeneration itself. So I was looking forward to the assumption of Peter Capaldi's Doctor into his role. And I'm still trying to digest it. It is definitely Capaldi stepping into the role he has dreamed of having for most of his life. I just wasn't expecting... well... a Doctor so dark taking over the controls of the TARDIS. His costume alone says volumes. I didn't write about it when it was revealed but I've loved that look ever since. It definitely has a healthy dose of Jon Pertwee's ensemble (absent the ruffles) but there's also the First Doctor's look, a dash of Eighth Doctor's attire and a healthy pinch of the Ninth Doctor's outfit. Peter Capaldi's outfit is what I call "the Johnny Cash costume". He's the Man in Black of the Time Lord set. This costume confidently tell us "The fun and games are over, time to get serious." But of course, it's not the looks alone that a Doctor make. Most of all, there is the personality. What that actor brings of himself into the role. What makes the current generation of the Doctor his own. Three episodes in, and Capaldi is nailing it. He is absolutely bringing it as the Doctor. And the more I watch him the more I'm discovering that he's already among my favorite incarnations of the runaway Time Lord. "Deep Breath" almost... almost... completely satisfies as a story. That, despite having all of the elements there for a proper explosive first story for the new Doctor as was his regeneration in last year's Christmas special. I mean, we have dinosaurs. We have mysterious deaths. We have the return of Vastra, Jenny and Strax (who never fails to crack me up). Clara (Jenna Coleman) is increasingly becoming one of my fondest companions in the entire history of the show, especially with her performance in that final scene. And the new Doctor's gradual process of taking on his proper role is frantic and manic and just plum delightful to watch in spite of his utter confusion (again, this is a good thing). Where "Deep Breath" went wrong for me is that it seems too long of an episode. I think it was an hour and a half? There could have been some editing of the second half and it wouldn't seem to have been bogged down in that section of the episode. But that's really a minor quibble in the scheme of things. And it more than made up for it in the the scene with the telephone at the end (you know what I'm talking about if you've seen it, and if you haven't then I'm not going to spoil it here). I will also say this: the return of the clockwork robots was an utter delight. When I first saw their inner workings in the half-faced man I wondered if Moffatt was taking us back into "The Girl in the Fireplace" territory. And when the Doctor pulled that circuit out of the console and we see the name imprinted upon it... well, I nearly shrieked with delight. Because "The Girl in the Fireplace" is my #1 favorite episode of the revived series's run and some consider it to be the finest Doctor Who story ever. That also made up for what might have been too long of a running time for this episode. I'd give "Deep Breath" 4 and 1/2 sonic screwdrivers out of 5 on The Knight Shift's longstanding rating system for Doctor Who. Didn't quite hit the mark completely, but it's pretty dang close. And I will go on record as saying that I thought the "assumption" scene was spot-on for this new Doctor. With all due respect to Mr. Capaldi and that this was the one thing he was looking forward to most as the Doctor, this episode came way too SOON for his tenure. For two reasons. First, out of the four most recent stories ("The Day of the Doctor", "The Time of the Doctor", "Deep Breath" and now this episode) the Doctor has faced the Daleks three times. Dear Steven Moffatt: please give the Daleks a rest for a while. Yes, we love the Daleks. We love to hate the Daleks. But there is such a thing as too much Dalek. I'm sure Terry Nation's estate is eating all this up like gangbusters but it's simply over-saturating the Doctor Who mythos right now. I wouldn't mind if the entirety of next season was without a Dalek story. If there is one, then the only way it could merit that is if it had the return of Davros... and even that would have to be pretty gosh-darned worth it. So for the Twelfth Doctor's sophomore outing what do we get, but a Dalek episode. I thought "Into the Dalek" was a fairly good episode, but as I said it just came too soon. And this goes to the second reason why I say that. It's because Peter Capaldi needs to "earn some flying time" before taking on the Doctor's oldest and greatest adversaries. He's still showing us that he really does have the chops to fight the classic bad guys, and not just the Daleks but also the Cybermen and the Weeping Angels and all of that lot. But I will also say that "Into the Dalek" is the first episode that gives us the Twelfth Doctor in all his magnificent glory... and I think that it will only get better. "Into the Dalek" receives 3 and 1/2 sonic screwdrivers. With most of the deductions going for, I say again, that it comes too soon in Capaldi's reign. Here's hoping that Moffatt and crew will recognize this and lay off the Daleks for a spell. And then there's this weekend's entry "Robot of Sherwood". This was a total hoot of a story to watch! 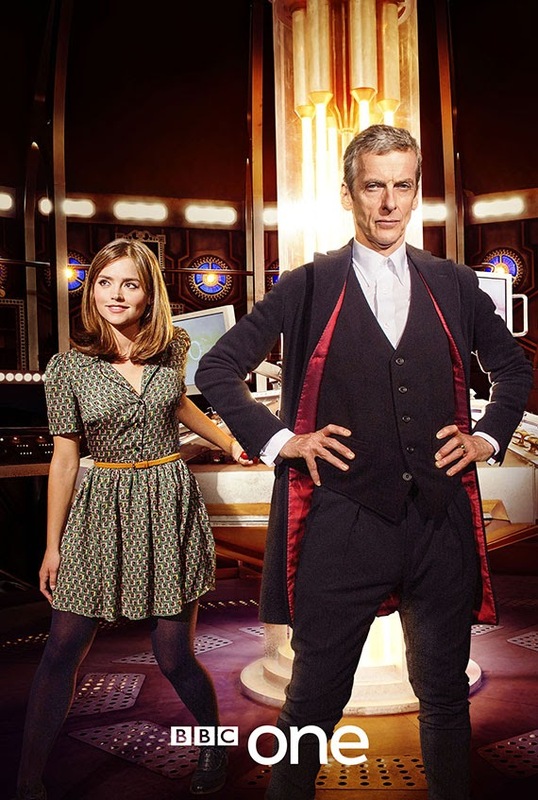 Not the least of which is that the chemistry is getting better and better between Clara and the Twelfth Doctor. In "Robot of Sherwood" she really does come across as having accepted that this actually, seriously is the Doctor that she once knew with Matt Smith's face. It's not just her playing alongside a different actor carrying the name now. "Robot of Sherwood" I think marks the true beginning of the dynamic between the Twelfth Doctor and Clara. We see that in the first scene when the Doctor asks Clara where she wants to go and she gleefully replies Sherwood Forest in the time of Robin Hood. Which of course, the Doctor knows wasn't real. Without spoiling it for anyone who hasn't watched it yet, "Robot of Sherwood" was just plain rollickin' fun to behold. Capaldi gets to show us a more action-oriented Twelfth Doctor, maybe even a Doctor that we have rarely seen embrace the role quite so vigorously. The archery scene is hilarious. And the revelation of what is really going on was quite satisfying. I thought that there was quite a bit of "Robot of Sherwood" that hearkened to "State of Decay" from Tom Baker's Fourth Doctor era. And that's not a bad thing either. I'm going to give "Robot of Sherwood" a score of 4 sonic screwdrivers. And I'm going to note that if this episode is any indication, the production and the writing for the Twelfth Doctor's time is getting better with each new story. It's going to be a lot of fun to see what is going to transpire throughout the rest of the season. But please, Steven Moffatt: NO MORE DALEKS FOR AWHILE! Excellent recap. What do you think of the new titles?